Vivid Sydney: A festival of light you shouldn't miss! I love festivals. Even so, it took me a while to get into Vivid. 'Lights shining on buildings' - how exciting could that be? As it turns out - really exciting, especially when one of those buildings is the spectacular Sydney Opera House! Vivid Sydney is in its ninth year. For the first five or so of those years I couldn't be bothered making the effort to drag myself into town to see it. It is only a twenty minute train trip from where I live, but Vivid is on in late autumn. It is cold and dark! I am not a great fan of either. A few years ago a family event forced me into the city purely by chance during the Vivid festival. Since I was there anyway I dragged David into town too, organised dinner in the city with number one son, dug my overcoat and winter boots out of the back of the wardrobe and set off to find out what all the Vivid fuss was about. Q Station Manly: A unique place in Sydney's history. On Thursday 18 May 1882, 25 year old Thomas Frost, his wife Evelina, 23 and their three children Clara 5, Florence 3 and Christina 1, set sail on the ship Orontes from Plymouth in England en route to Sydney, Australia. Clara was my great grandmother. Two months later, on 19 July the Orontes arrived in Sydney Harbour. It was a migrant ship and my forbears and their fellow passengers came to Australia to begin a new life. However before they were allowed to disembark, the Orontes like all other migrant ships arriving in Sydney had to be declared free of contagious diseases. Sculpture by the Sea is 20 years old. 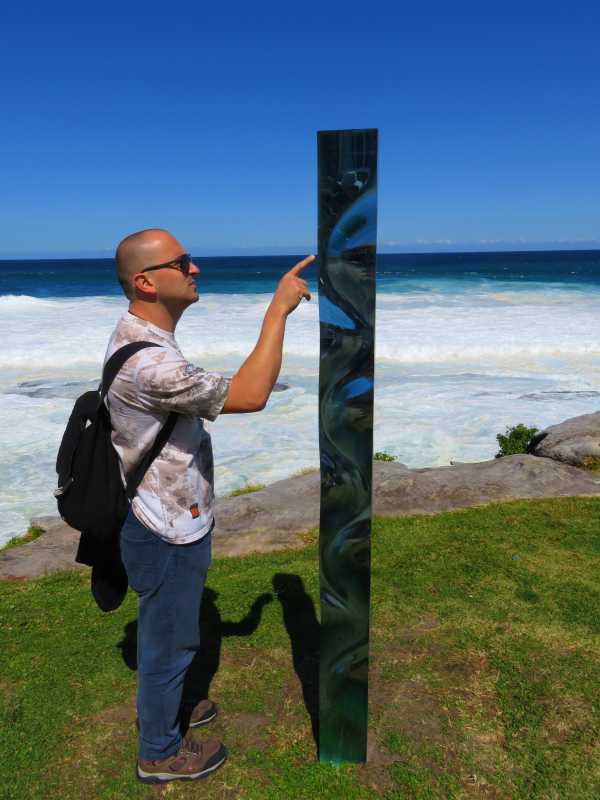 Set against the stunning backdrop of the Bondi to Coogee Coastal Walk, Sydney's Sculpture by the Sea is the largest annual sculpture exhibition in the world. David and I try to go every year and this year turned out to be a lot more dramatic than most. As we watched from the safety of the cliffs, a king tide combined with huge waves sent one sculpture into oblivion and damaged several others. It was as though mother nature was determined to put her mark on the exhibition. Not really being the artistic type there isn't a lot I can say about sculpture, so sit back and enjoy the photos of some of my favourites. I have included the prices in the captions just in case you have a bit of spare change laying around and fancy a bit of modern art for the front garden. Do you believe in ghosts? I do - now! 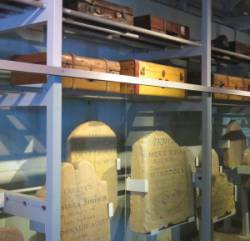 A ghost tour at Q Station, the old quarantine station at Manly in Sydney's north, will shake the scepticism out of the most ardent non-believer. It is well after dark. We have had a long, enjoyable dinner at the Boilerhouse Restaurant where, under the guidance of chef Matt Kemp, the food is nothing short of spectacular. Bob, our ghost hunting guide, meets us below the giant stairway which leads to the upper levels of Q Station. Earlier today we were told contestants on The Biggest Loser run up and down these stairs as part of their weight-loss regimes. I wonder how many don't make it - no wonder they say the place is haunted. 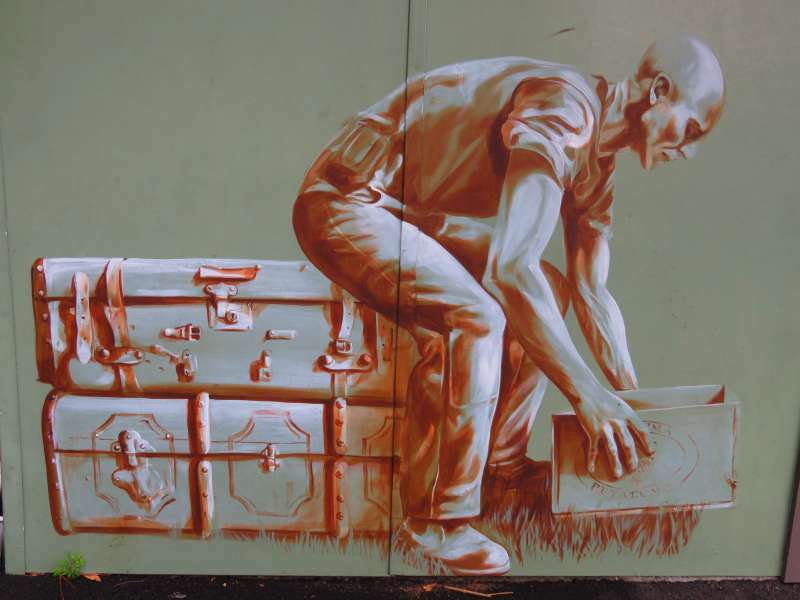 Each year Sydney's Inner West Council hosts a celebration of street art called Perfect Match. The council matches up owners of walls in need of beautifying with artists who express themselves through the use of spray paint and brushes. As well as brightening up the neighbourhood, Perfect Match hosts free walking, bicycle and bus tours allowing onlookers to view the art as it is being created, meet the artists while they work and see some of the finished works. David and I were due to join a bicycle tour to do just that last weekend. However living in a city with one of the world's best climates we tend to be very fickle about the weather. If the temperature drops a few degrees lower than perfect, or there are a couple of clouds on the horizon, David declares the day ruined. 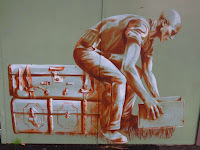 With wind and rain forecast on the day of our street art cycling tour, we abandoned the idea and stayed home. As it turned out, the sun came out around midday and the afternoon weather was lovely but how we were to know that. Sydney, Australia - The top 5 things tourists do which locals avoid. Have you ever wondered whether Egyptians visit the pyramids, Parisians climb the Eiffel Tower or New Yorkers wander around the Statute of Liberty? 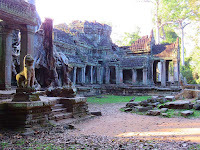 David and I have done all these things as well as countless other iconic activities around the world, but I have often wondered whether locals living their lives every day in the shadow of such massive tourist drawcards ever bother to visit them. Mention Sydney and 'Things to do' to any tourist and I can almost guarantee which activity will be the top of their list. It has become so popular it is almost synonymous with the city. Yet I haven't done it, nor has David, our adult children, or most of our friends. I am sure you can guess what I am talking about: if you have been a tourist in Sydney you have probably done it yourself. 'Get out on the harbour!' - This is the one piece of advice I always give visitors. You can't truly appreciate Sydney without seeing it from the water. I also used to say it didn't matter whether you went on a tour or a ferry, but David and I recently spent a day with Captain Cook Cruises Hop on Hop Off Sydney Harbour Explorer and the experience was so much better than riding the ordinary ferries I can't believe how much we have missed over the years. There are some things you have to do just once in a lifetime. Helicopter flightseeing above Sydney Harbour has been top of my wishlist for quite a while and a few days ago I got the chance to tick it off. Thanks to Adrenalin, David and I took a half-hour private helicopter tour over Sydney. Did the tour live up to our expectations? Yes!! - and exceeded them, by about 1000%. The only problem is, I want to do it again, and again and again. I think I'm hooked. Last Sunday David and I took part in a cruise on Sydney Harbour organised by Qantas as part of its 95th birthday celebrations. The cruise gave us a chance to photograph our beautiful city from the Harbour. We were then encouraged to post our photos on Instagram. I admit I'm a newbie when it comes to Instagram but I do love Sydney so this week instead of my usual blog post I wanted to share with you some photos of the city we call home. Vivid Sydney is an 18 day festival of light, music and ideas bringing Australia's Emerald City to life as winter approaches. This year Vivid began on 22 May and finishes on 8 June. Just for once, I'll let my camera do the talking. Terrain - Mostly separated bike path with a few short on road connections. Sealed for the full distance. Highlights - The views of Sydney's beautiful harbour. 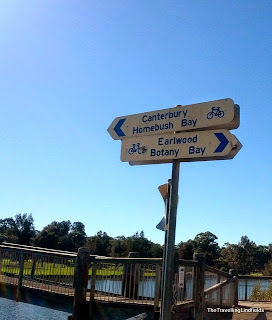 Cycling in Sydney: The Cooks River Cycle Way, from Strathfield to Botany Bay. 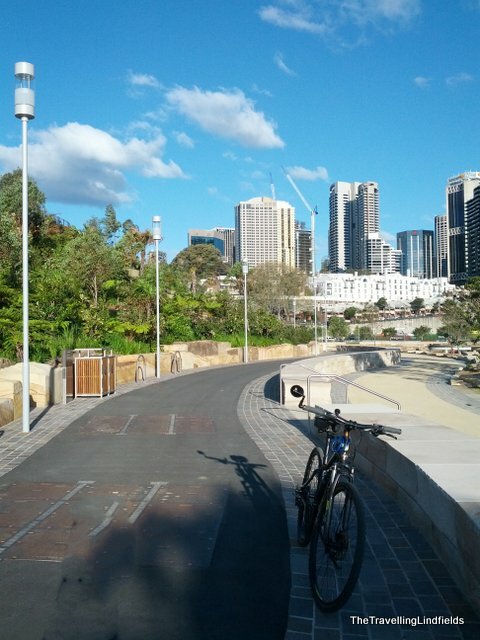 Terrain - Mostly separated bike path with a few on road connections. Sealed for the full distance. Highlights - Sitting watching the planes take off and land on the Botany Bay runway. Terrain - Shared pedestrian path and cycleway with a couple of hundred metres on road. 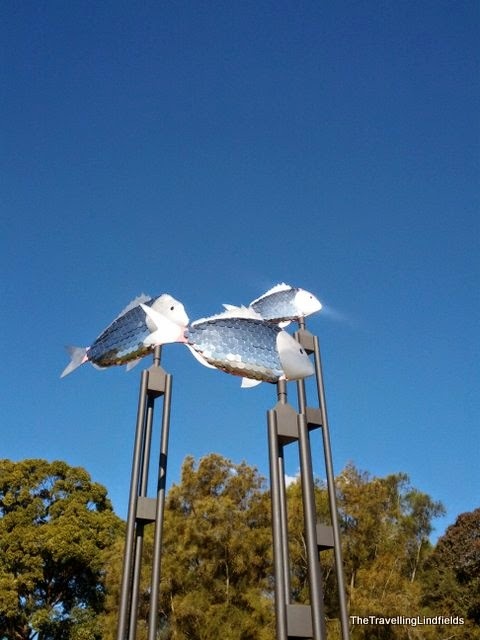 Highlights - Having lunch in the sunshine sitting on the grass next to the Parramatta River. 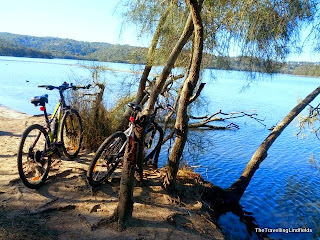 Cycling in Sydney - Putney Park Loop. Ride - Putney Park loop - from Putney Park to Ryde Bridge then around through Concord Hospital grounds and back across to Putney on the Mortlake Ferry, Sydney. Highlights - Crossing the Parramatta River on the Mortlake punt.